The shape and character CAVE different, and those differences cause the method to enter this cave different. There are climbing, rope, and there is even a swim. But there is also a cave that is easy to enter because of the entrance of the cave has been built with a neat and well. 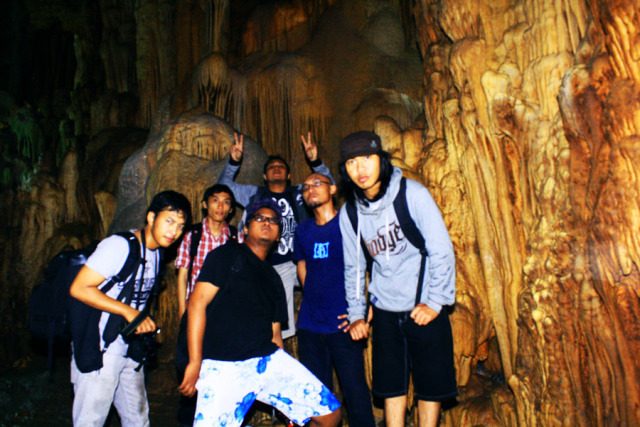 Should cave tours. Some fans of this sport no one came to the cave to capture the beauty and magic of the caves, good decor and some animal cave that is in the cave. For that purpose, come with a set of photo tools. Before getting to know the technique to explore the cave we got to know some of the terrain / cave different types in order to apply the techniques and prepare everything so that more mature things. 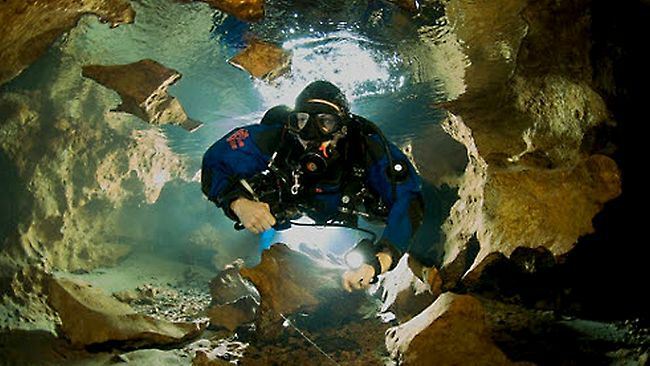 For a watery cave conditions, especially for who has never entered the cave we do not know the depth of the water and the underwater conditions, therefore we must know the depth and underwater conditions, therefore we must know the procedure and have support facilities. The main requirement for passing a watery aisle is to be able to swim. But the hallways are very limited conditions, different swimming techniques in the cave by swimming outside the cave. Because here we fully dressed, boots might even bring a heavy burden. Division team should also be adjusted. Leader should not carry heavy loads, as it makes the track and learn the terrain. Under certain conditions we are using float even rubber boats, especially for the long hall and juicy inside. There is also a hallway that almost all filled with water and there is little room left. For the past we had to do Ducking (looking up). - Duck Walking is the squat with one arm extended forward. 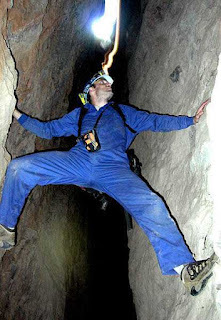 is a technique used to explore caves for vertically using the rope as a path to go up and down a vertical field-crazy. Various systems have been developed in accordance with the conditions of the terrain in the birthplace of each method. However, the most widely used is the Frog Rig System. Another technique is: Rope walker, Texas Rig, Jumaring, Mitchele System, Floating cam system. 1. 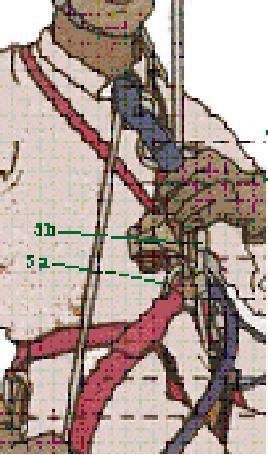 Seat harness, used to tie the body and other tools. Installed in the waist and groin. The types are: Bucklet, Avantee, Croll, Rapid, and Fractio. Seatharness consumption habits depending closeness. 3. 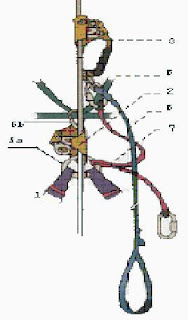 Hand Ascender, used to climb (up) path or a rope in hand. At the bottom of the descender mounted, hung a foot loop and cows tail. 5. 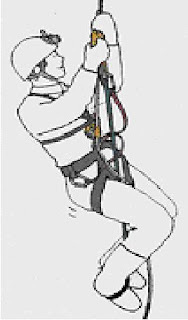 Mailon Rapid, there are two kinds of Mailon Rapid (MR), namely: Oval MR to associate Chest Ascender to the Delta MR. Delta MR itself is to link the two loops Seat Harness and linking other devices as follows Carabiner Descender as friksinya and Cowstail. 6. 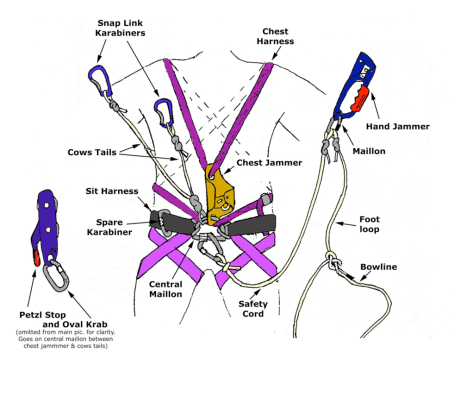 Foot loop, Anchored to the carabiner that is connected to a hand ascender. Serves as a footrest. The size of the foot loops should be exactly as shown above. This greatly reduces fatigue when ascending in PITC long-pith. 7. Cows tail, has two tails. 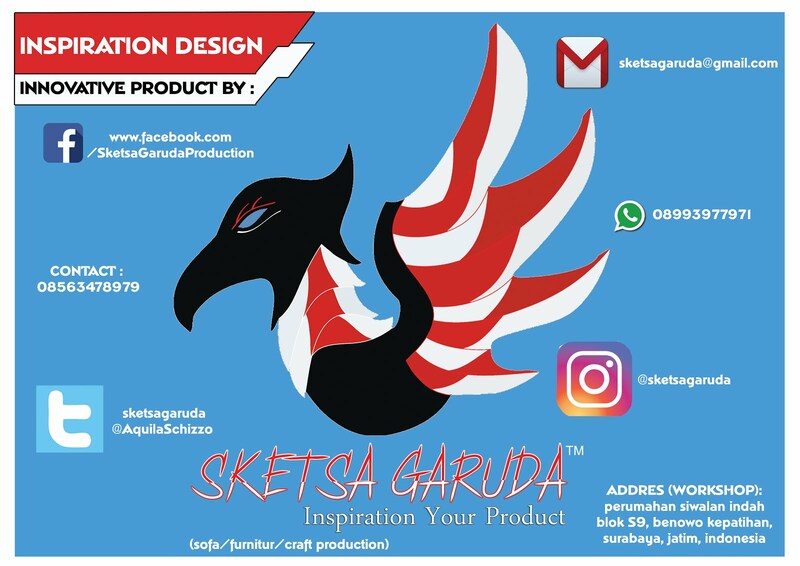 One related to Hand Ascender, and another one free, used for safety while passing through intermediate trajectories, deviation, passing connection, tyrolean, and traverse. 8. Chest harness, to attach Chest Ascender to be more closer to the chest. To facilitate movement during normal ascending, or when passing through the connection string. 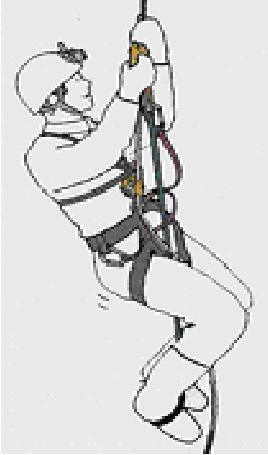 Chest harness better if it can be arranged short length (adjustable), so as to facilitate the operation, especially if there is a case where the connection Chest Ascender locked or node, or at the time of rescue. The techniques that must be learned for the SRT is ascending and descending the mastery of passing the types of track and field. ~ 4. 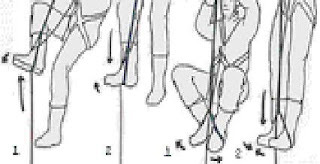 Tyrolean trajectory passes, using a rope and two ropes. ~ 5. Climbing the rope with the terrain slope (sloping). Note the movement of the feet while ascending. 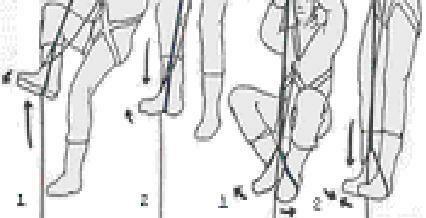 Move your feet to clamp the rope with your feet. The first way is using a rope clamp part in the ankle with outer soles. The second way is pinning rope with both feet when standing movement. When lifting both legs, both feet opened. 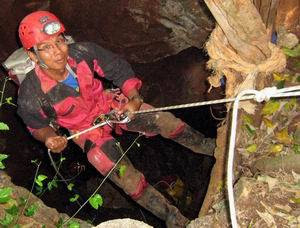 Climbing is used when you want to find a new shortcut to descend or ascend the cave. To use this technique you have to use a safety strap to keep from falling. 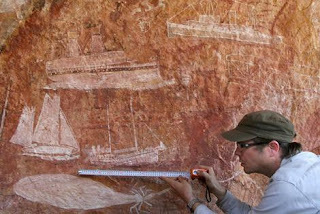 Together with climbing, digging method was also used to explore new avenues. Only, digging method used regularly and over a long time, can be weekly, monthly or even yearly. Tools and methods used in the excavation that was very varied. 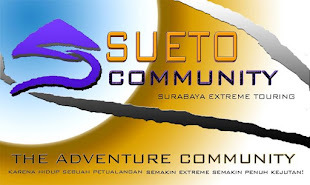 Sometimes - sometimes be accompanied by a camp in the cave. If you get a part of the cave is filled with water then you have to use the method of diving. 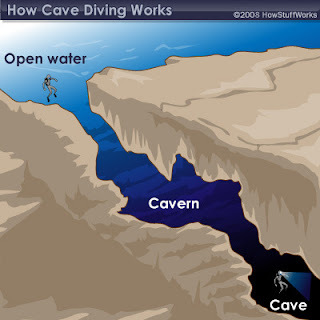 If the submerged only a fraction of the cave, you can do free diving without any equipment. You see, that's the most practical method. 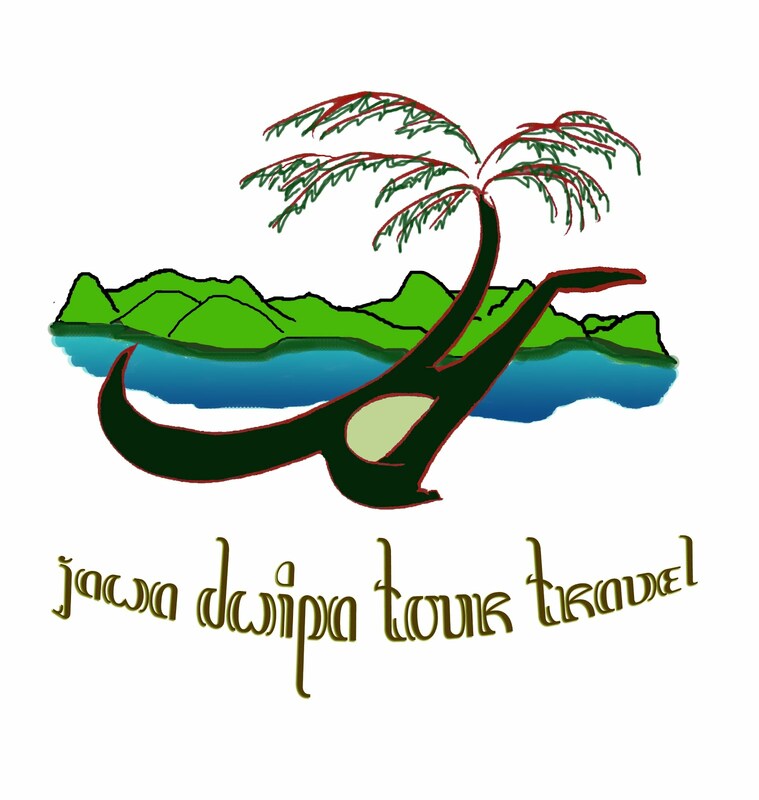 However, when part of the cave was pretty much stagnant water and far, for example until a few kilomter then you must do the dives are accompanied with complete equipment. However, sports enthusiasts who choose this specialization Caving very little. Specialization is the most popular among the lovers of caving. You came to the cave with the stock camera then look for the most beautiful locations for immortalized. As a result, you can publish it in books - books or magazines. This method is the development of a sense of interest of people to the beauty of the cave. 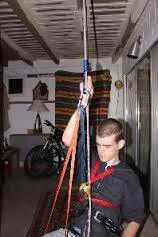 ~ This exercise should be carried out using equipment that meets the standards of quality and strength. ~ Exercise should be under supervision by experts. 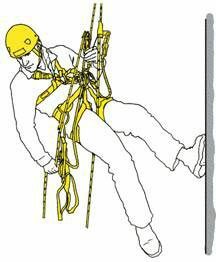 ~ Practice at a height that is not too high. ~ Prevent exercises that can damage the appliance: appliance overload exceeds the normal load, the load with abnormal direction, using the tool is not in accordance with its manual book. Exercises are done using alternative tools, should be still in the safe level. ~ Never exercise a particular technique is not a guarantee that we have mastered the technique. ~ Practice the technique to smoothly without a hitch and error before practicing other techniques. ~ practice by always accompanied by another person who also understands the SRT. ~ Berniatlah practice to help others and yourself. 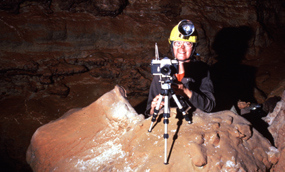 ~ Avoid accidents in the cave to others or to themselves.